The Boardwalk Tower and Boardwalk Beast are down for maintenance. At Kemah Boardwalk, it's like a summer fair all year long! Check out our rides and games that kids (and adults) of all ages can enjoy! Hours are seasonal and subject to change. 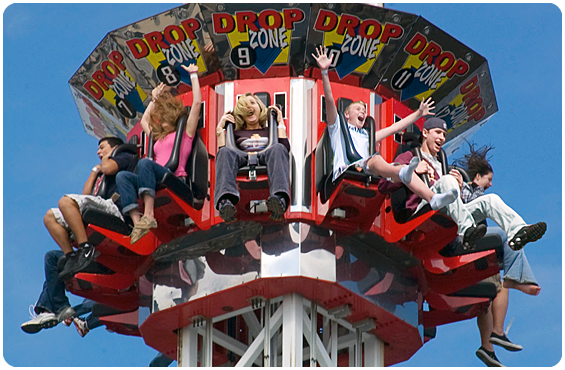 Buy an All Day Ride Pass and experience our rides over and over as many times as you can in a day! All Day Ride Pass does not include the Boardwalk Beast, Stingray Reef, Iron Eagle, Midway Games or Arcade. Military and Veteran $2 discounts available on All Day All Ride Passes with valid active military ID or VA ID card – valid up to four passes. $2 discount also available on Boardwalk Beast tickets. 10% discount on Kemah owned Retail stores. Must show valid military ID or VA ID card when purchasing. Please visit the ticket booth for more details.